Karl Marx, the father of Communism, once said, “Religion is the opium of the people.” For reasons that have been apparent and studied by academics, religion as it relates to theism is not a tenant of communism, or any of its branches. As such, a disturbing metamorphosis is underway in the Peoples Republic of China (PRC), foreshadowing change that depicts a return to a darker period. Since its genesis in 1949, the PRC has been hostile to religion (theism) as it relates to communism, as well as it being a reminder of early feudalism and colonialism of its past. Houses of worship, including temples, mosques and churches, were converted into non-religious buildings for secular use. The cultural revolution of the 1970’s somewhat relaxed what would be considered draconian events by Western society norms, and allowed “freedom of religion” with a heavy hand of restriction. Reminiscent of first century Roman polytheism, with its array of sects including Greek theology and cults, China had been tolerant to an extent to polytheistic views, undertaking massive programs to rebuild Buddhist and Taoist temples. However, like the post-resurrection purge of Christians from Rome, persecution is now on the front lines of an ambitious new effort by the officially atheist ruling Communist Party to dictate, and in some cases displace, the practice of faith in the country. Under President Xi Jinping, who recently has assumed tenure as China’s most powerful leader since Mao Zedong, the predictable has come to fruition, which should be no surprise. In what is a slow and carefully thought out dogma, Xi is systematically infusing secular Chinese culture into traditional religion. One would assume that this is an initial foray into what will be a further cleansing of Christianity et al. through what can only be by definition an atheistic culture. As Jesus threatened the Pharisees and Sadducees, so does he rattle Chairman Xi. 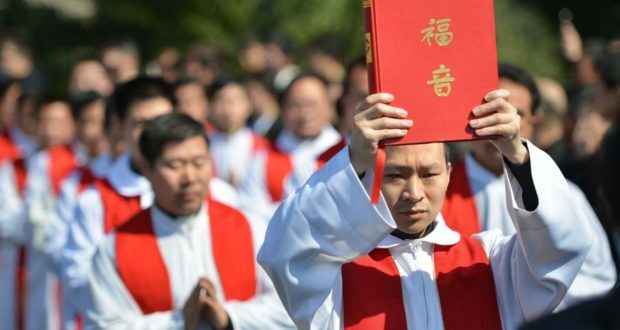 “Chinese leaders have always been suspicious of the political challenge or threat that Christianity poses to the Communist regime,” said Xi Lian, a scholar of Christianity in China at Duke University. “Under Xi, this fear of Western infiltration has intensified and gained a prominence that we haven’t seen for a long time.” The utopian thought-speak is alive and well in China and does not play favorites with Christianity. The “crime” of being a Muslim, if detected, can have one humiliated, brainwashed, and tortured. The communist propaganda gives the reeducated the wonderful pleasure of chanting glorious slogans beholding the state and hanging posters of Chairman Xi in their living rooms. The pacifist left of the west offer up burkas for the woman and prayer rugs for the Islamic men as their countries become inundated, or should we use their terminology, “diversified,” by Muslims. There will be no jihad in Beijing. As religious extremism has begun in places like Xinjiang, the communist party has quickly stepped in to eliminate Islamic tension. You see, tolerance or Uber-tolerance as believed in Germany and elsewhere in Europe will not be allowed in China. Chairman Xi is Mao Zedong in sheep’s clothing, or should we say Winnie the Pooh costume. You see boys and girls, there will be no café bombings and knife wielding terror attacks in Xinjiang or any province for that matter. No one would argue, least the re-educators, that these methods violate basic human rights and are inhumane. However, certain societies, not excluding Russia, will not tolerate a dilution of their heritage in any way, shape or form. Their methods of doing this are quite outrageous, but this is their twisted way of believing how they can maintain their cultural heritage. While the west must juxtapose its ability to be inclusive while maintaining its own ancestry, this will not be a problem for China. The Hitlerian final solution that was the termination of the Zionists finds itself alive and well, albeit in a Hitlerian-light formula, in Xinjiang. Under Chairman Xi, the Peoples Republic of China is again dawning red shirts and doing their own version of goose-stepping to the beat of the party. Do not be fooled by the cell phone sophisticated youth of China. Those that the west would hold up as a shining example of how capitalism and communism can coexist. Those cell phones are monitored day and night, and God forbid you are talking about God.